Oh my…….two posts in one day. 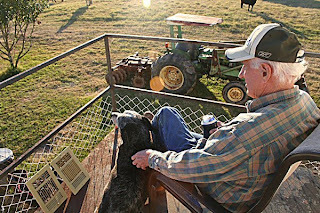 BUT, I took these pictures yesterday afternoon while my husband , and Junior were taking a break on my little back porch on the studio. We saw the “pet” and some other cows making their way up from the lake and couldn’t resist taking a couple of pictures. Over the past few years, I’ve been fortunate to have my work chosen for 5 different book covers. Two books have been from a wonderful poet who teaches at the University of Alabama, Theodore Worozbyt. Yesterday he sent me this link to an interview he had about his books. My work featured on the cover is mentioned and his quotes made my day. Pieces of Red 5 will grace the cover of the award winning poetry book, The Dauber Wings, by Theodore Worozbyt. I’m showing some pictures taken over the past couple of weeks…. 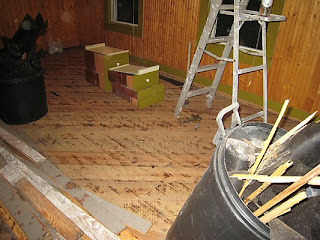 First the slow process of removing old flooring and down to the old pine boards. A nasty process, I assure you. Also the removal of a couple of layers on some of the walls, down to some old wallpaper when it must have been a dining or living room. This was found when taking out the old pantry area we are going to use as part of the new kitchen cooking/prep area. New wallboard had to be installed. Thank goodness it didn’t have to look perfect since the new cabinetry will cover most all of it anyway. Nothing is perfect in this old a house anyway…….so you might as well like it that way. The area where the old sink was is the area with the only two cabinets we left around the sink window. 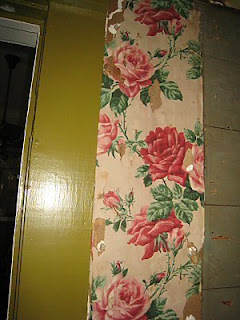 ( We still have to put in new bead board to meet the old here. This was the ONLY counter space in the old kitchen. Since I wanted to leave SOMETHING of the old, we left these two old cabinets, removed the doors, and I will leave them as open shelves for my blue and white dishes and also near the dining area in the kitchen for convenience. 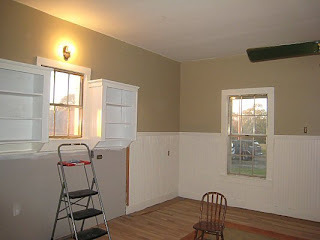 At the beginning I will paint the interior the same SW Universal Khaki as the walls about the wainscoting…….later I may add more color as is appropriate for the dishes displayed. My husband (favorite helper) is doing most of the grunt work on this project. We are hiring out all the plumbing, electrical, cabinets and the new white oak floors are now installed but not yet finished. The same man who finished the other adjacent floors will be doing the work…starting on Thursday. I have no idea how long that will take but it will be three visits he says. 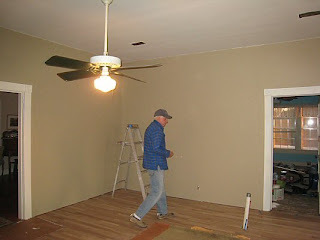 After that will be the new cabinets installed………..WE have to paint them…paint grade maple. All the appliances are here. Are you tired yet? I am, but still have to finalize what hardware and counters/back splashes and get some schedule for the installation of new wiring, the rest of the plumbing and the venting, etc. I plan on a dark quartz counter top. Off Tuesday to deliver more paintings to Dallas so it might be some time before I get back to the blog. 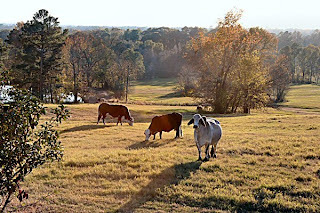 AND, I have been informed I will have Thanksgiving company………..
There’s a lot going on here at the farm but not a lot of it is making art much to my disappointment. My mom died so I ended up making two trips to Oklahoma. We’ve gutted a bathroom and the whole kitchen. The floors and some of the walls had to be stripped back so it was a long physical process (mostly for my husband) as he does most of this physical work. I have to be there to just lend support and the hammer and nails so to speak. I have ordered and received the new appliances and have the cabinet man starting to work. We’ve had plumbers, need electricians and then the plumbers back later. 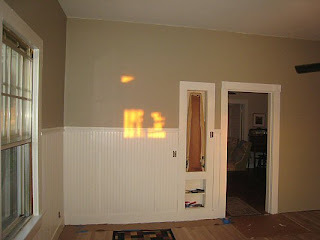 I haven’t a clue what back splash and counter top I want as I’m just going from one project to another helter-skelter. We also will not do anything without cash in hand so I wait daily for set-backs which would make the budget (What budget??) go out the window. The new oak floors will be installed on Thursday but I can’t get the finisher on the phone. I have a gallery interested in my work so I’m running back to Dallas Tuesday to take them some work. Fifteen gazillion people call wanting to know how much my house in Longview is selling for. 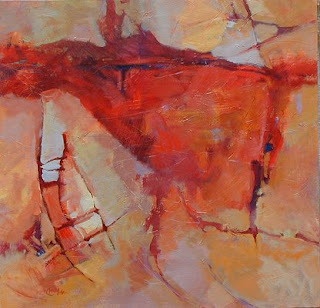 My Seattle gallery, Gallery Mack, sold a large painting…………..yaaay Gallery Mack. Over the week-end my thirteen year-old grandson came for the opening of deer season…his dad came the next day and also my daughter and granddaughter. It was a interesting situation with only one bed due to all the upheaval here………but two hideabeds. One is in the studio so we all ate up there and two slept up there. Looks like they all like my studio. OH yeah….didn’t kill a deer ( saw some) but did kill that huge hog and did some stalking of the beaver that keeps damming up the spillway on the pond. I have time to write this since I got upstairs to make coffee and discovered I had forgotten to set back the alarm clock, although I think I’ve re-set all the others. Joke’s on me I guess. I’ll be drooping tonight from being up so early.